Picture: These people are not real – they were produced by our generator that allows control over different aspects of the image. ├ stylegan-paper.pdf High-quality version of the paper PDF. ├ stylegan-video.mp4 High-quality version of the result video. ├ images Example images produced by our generator. │ ├ representative-images High-quality images to be used in articles, blog posts, etc. │ └ 100k-generated-images 100,000 generated images for different amounts of truncation. │ ├ ffhq-1024x1024 Generated using Flickr-Faces-HQ at 1024×1024. │ ├ bedrooms-256x256 Generated using LSUN Bedroom at 256×256. │ ├ cars-512x384 Generated using LSUN Car at 512×384. │ └ cats-256x256 Generated using LSUN Cat at 256×256. ├ videos Example videos produced by our generator. │ └ high-quality-video-clips Individual segments of the result video as high-quality MP4. 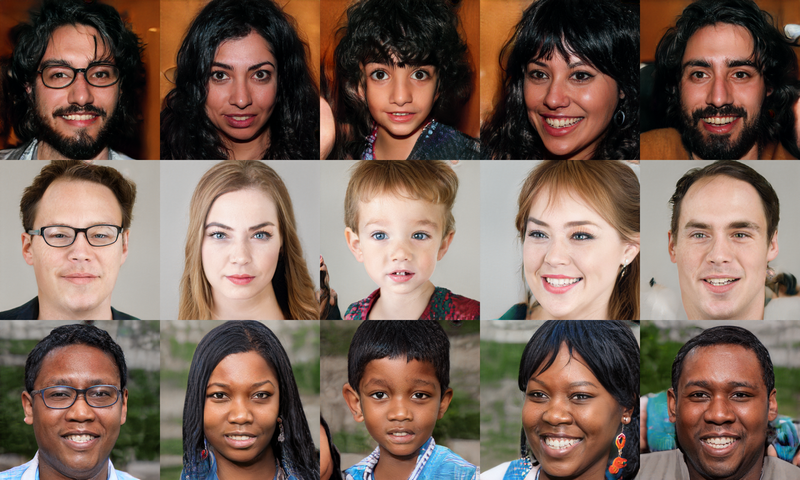 ├ ffhq-dataset Raw data for the Flickr-Faces-HQ dataset. └ networks Pre-trained networks as pickled instances of dnnlib.tflib.Network. ├ stylegan-ffhq-1024x1024.pkl StyleGAN trained with Flickr-Faces-HQ dataset at 1024×1024. ├ stylegan-celebahq-1024x1024.pkl StyleGAN trained with CelebA-HQ dataset at 1024×1024. ├ stylegan-bedrooms-256x256.pkl StyleGAN trained with LSUN Bedroom dataset at 256×256. ├ stylegan-cars-512x384.pkl StyleGAN trained with LSUN Car dataset at 512×384. ├ stylegan-cats-256x256.pkl StyleGAN trained with LSUN Cat dataset at 256×256. └ metrics Auxiliary networks for the quality and disentanglement metrics. ├ inception_v3_features.pkl Standard Inception-v3 classifier that outputs a raw feature vector. ├ vgg16_zhang_perceptual.pkl Standard LPIPS metric to estimate perceptual similarity. ├ celebahq-classifier-00-male.pkl Binary classifier trained to detect a single attribute of CelebA-HQ. └ ⋯ Please see the file listing for remaining networks. All material, excluding the Flickr-Faces-HQ dataset, is made available under Creative Commons BY-NC 4.0 license by NVIDIA Corporation. You can use, redistribute, and adapt the material for non-commercial purposes, as long as you give appropriate credit by citing our paper and indicating any changes that you've made. For license information regarding the FFHQ dataset, please refer to the Flickr-Faces-HQ repository. inception_v3_features.pkl and inception_v3_softmax.pkl are derived from the pre-trained Inception-v3 network by Christian Szegedy, Vincent Vanhoucke, Sergey Ioffe, Jonathon Shlens, and Zbigniew Wojna. The network was originally shared under Apache 2.0 license on the TensorFlow Models repository. vgg16.pkl and vgg16_zhang_perceptual.pkl are derived from the pre-trained VGG-16 network by Karen Simonyan and Andrew Zisserman. The network was originally shared under Creative Commons BY 4.0 license on the Very Deep Convolutional Networks for Large-Scale Visual Recognition project page. vgg16_zhang_perceptual.pkl is further derived from the pre-trained LPIPS weights by Richard Zhang, Phillip Isola, Alexei A. Efros, Eli Shechtman, and Oliver Wang. The weights were originally shared under BSD 2-Clause "Simplified" License on the PerceptualSimilarity repository. # _G = Instantaneous snapshot of the generator. Mainly useful for resuming a previous training run. # _D = Instantaneous snapshot of the discriminator. Mainly useful for resuming a previous training run. # Gs = Long-term average of the generator. Yields higher-quality results than the instantaneous snapshot. The above code downloads the file and unpickles it to yield 3 instances of dnnlib.tflib.Network. To generate images, you will typically want to use Gs – the other two networks are provided for completeness. In order for pickle.load() to work, you will need to have the dnnlib source directory in your PYTHONPATH and a tf.Session set as default. The session can initialized by calling dnnlib.tflib.init_tf(). The first argument is a batch of latent vectors of shape [num, 512]. The second argument is reserved for class labels (not used by StyleGAN). The remaining keyword arguments are optional and can be used to further modify the operation (see below). The output is a batch of images, whose format is dictated by the output_transform argument. The above code is from metrics/frechet_inception_distance.py. It generates a batch of random images and feeds them directly to the Inception-v3 network without having to convert the data to numpy arrays in between. The above code is from generate_figures.py. It first transforms a batch of latent vectors into the intermediate W space using the mapping network and then turns these vectors into a batch of images using the synthesis network. The dlatents array stores a separate copy of the same w vector for each layer of the synthesis network to facilitate style mixing. truncation_psi and truncation_cutoff control the truncation trick that that is performed by default when using Gs (ψ=0.7, cutoff=8). It can be disabled by setting truncation_psi=1 or is_validation=True, and the image quality can be further improved at the cost of variation by setting e.g. truncation_psi=0.5. Note that truncation is always disabled when using the sub-networks directly. The average w needed to manually perform the truncation trick can be looked up using Gs.get_var('dlatent_avg'). randomize_noise determines whether to use re-randomize the noise inputs for each generated image (True, default) or whether to use specific noise values for the entire minibatch (False). The specific values can be accessed via the tf.Variable instances that are found using [var for name, var in Gs.components.synthesis.vars.items() if name.startswith('noise')]. When using the mapping network directly, you can specify dlatent_broadcast=None to disable the automatic duplication of dlatents over the layers of the synthesis network. Runtime performance can be fine-tuned via structure='fixed' and dtype='float16'. The former disables support for progressive growing, which is not needed for a fully-trained generator, and the latter performs all computation using half-precision floating point arithmetic. To obtain the FFHQ dataset (datasets/ffhq), please refer to the Flickr-Faces-HQ repository. To obtain the CelebA-HQ dataset (datasets/celebahq), please refer to the Progressive GAN repository. The training may take several days (or weeks) to complete, depending on the configuration. By default, train.py is configured to train the highest-quality StyleGAN (configuration F in Table 1) for the FFHQ dataset at 1024×1024 resolution using 8 GPUs. Please note that we have used 8 GPUs in all of our experiments. Training with fewer GPUs may not produce identical results – if you wish to compare against our technique, we strongly recommend using the same number of GPUs. The quality and disentanglement metrics used in our paper can be evaluated using run_metrics.py. By default, the script will evaluate the Fréchet Inception Distance (fid50k) for the pre-trained FFHQ generator and write the results into a newly created directory under results. The exact behavior can be changed by uncommenting or editing specific lines in run_metrics.py. fid50k 16 min 4.4159 Fréchet Inception Distance using 50,000 images. ppl_zfull 55 min 664.8854 Perceptual Path Length for full paths in Z.
ppl_wfull 55 min 233.3059 Perceptual Path Length for full paths in W.
ppl_zend 55 min 666.1057 Perceptual Path Length for path endpoints in Z.
ppl_wend 55 min 197.2266 Perceptual Path Length for path endpoints in W.
w: 3.7447 Linear Separability in Z and W.
Please note that the exact results may vary from run to run due to the non-deterministic nature of TensorFlow. We thank Jaakko Lehtinen, David Luebke, and Tuomas Kynkäänniemi for in-depth discussions and helpful comments; Janne Hellsten, Tero Kuosmanen, and Pekka Jänis for compute infrastructure and help with the code release.